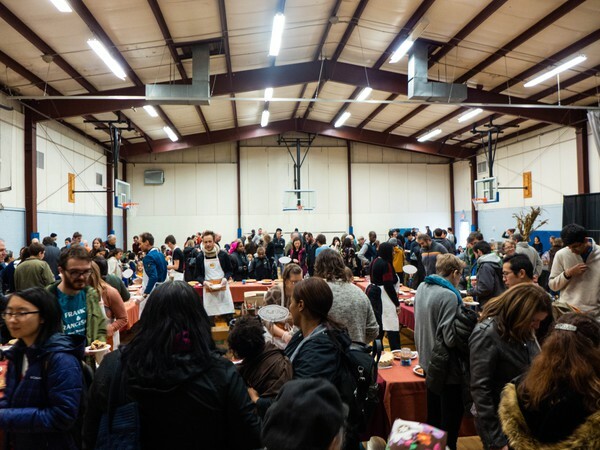 Hyde Park comes out to enjoy the fruits of its creative pie-making community at the South Side Pie Challenge. 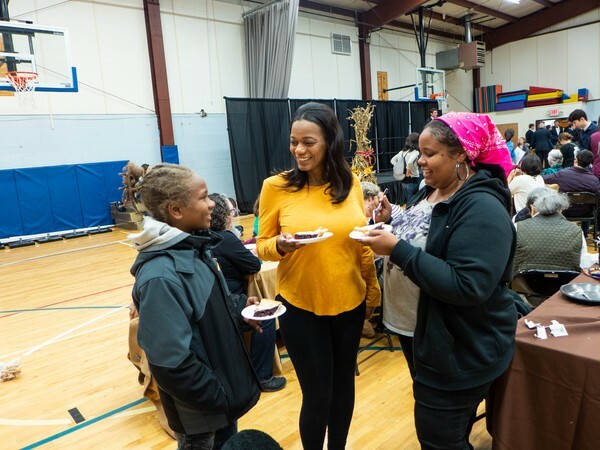 Community members from the South Side gathered in the Hyde Park Neighborhood Club last weekend to raise funds for the Hyde Park and Kenwood Hunger Programs as part of the eighth annual South Side Pie Challenge. 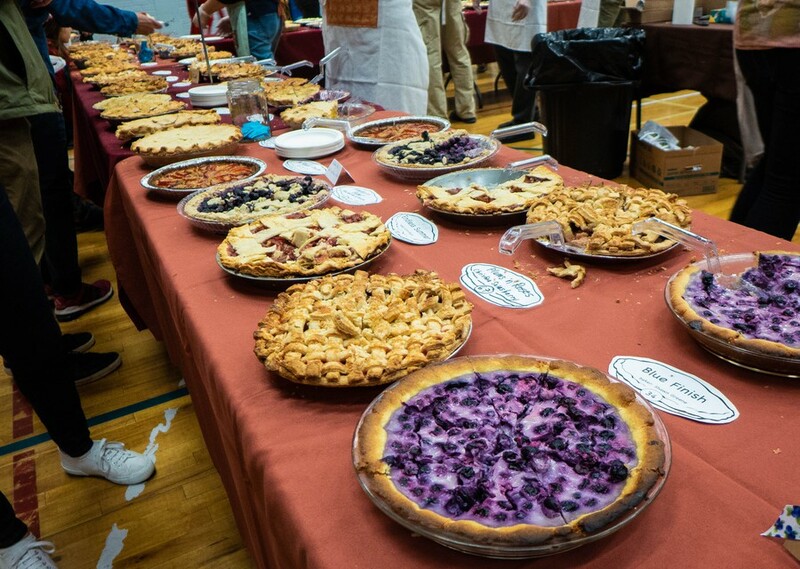 Contestants donated a record 68 pies and raised $4,500. 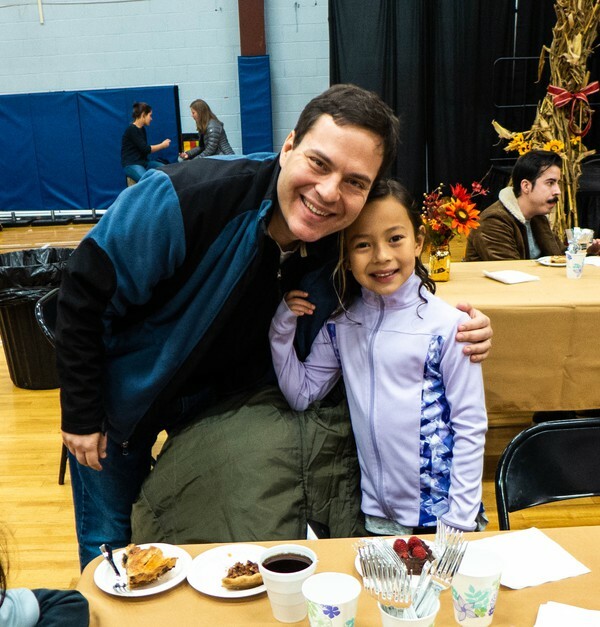 Judges included the pastry chef at The Promontory, the general manager of Medici Restaurants, and a competitor on MasterChef Junior. 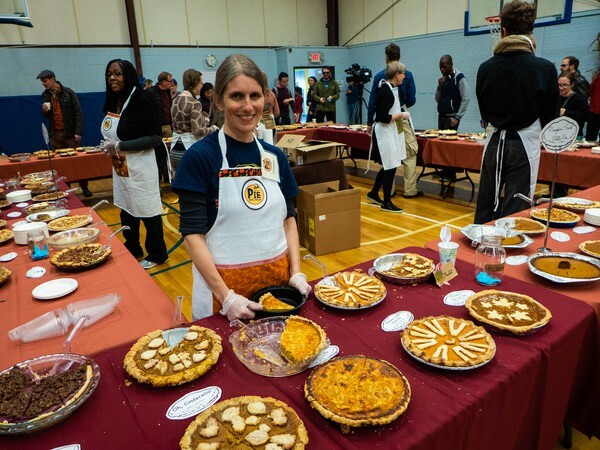 Molly Herron, pictured to the left, took home the grand prize for her plum pie named “What a good boy am I pie.” The event also featured live music by the University of Chicago Glee Club and a Chicago-wide youth ensemble. An hour in, the gymnasium is packed. Near the entrance, people peruses the pies, and watch the performances. On the other end of the gym, tables have filled up. “This is my favorite day of the year,” says Jordan Koss, left. 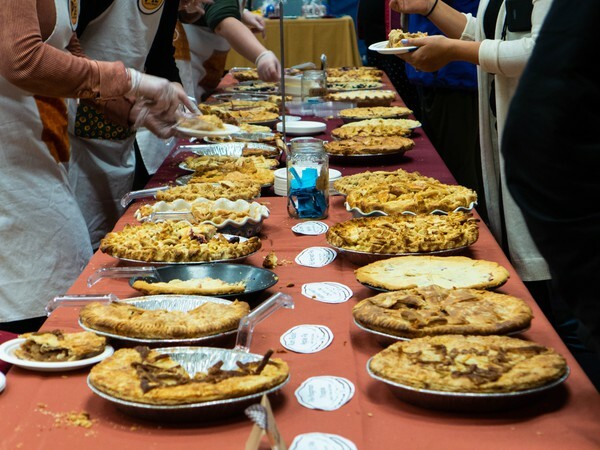 For them, The South Side Pie Challenge is a yearly outing. “I’m supporting my best friend in the South Side Pie Challenge,” says Antoinette McCray, right. Gail Davis, who baked a cherry pie, stands center alongside her godson and McCray’s son, Jaylin. Chris Andrews, prepares a pumpkin/cheesecake pie. 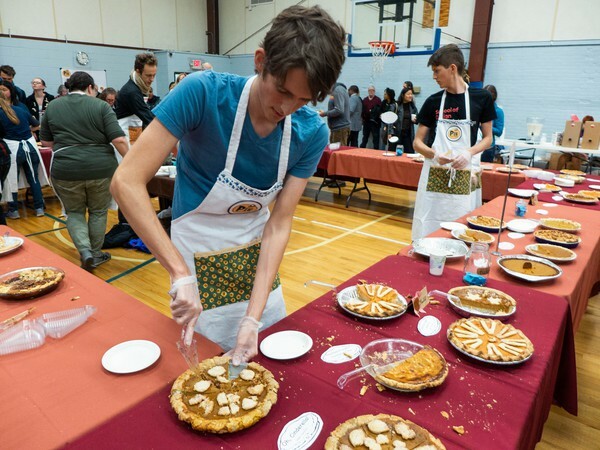 Andrews baked a blueberry rhubarb pie for the event, which sold out within half an hour, and placed third in the fruit pie category. 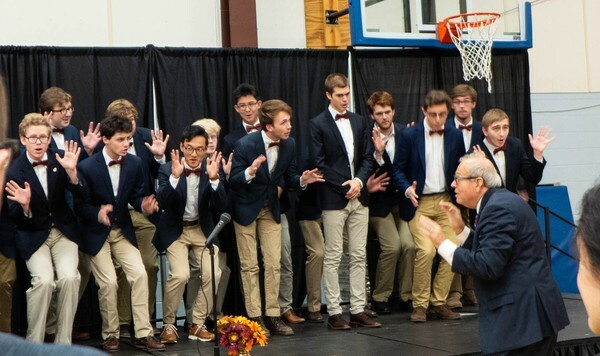 UChicago students in Chicago Men’s A Capella (CMAC) offer a lively performance at the event. 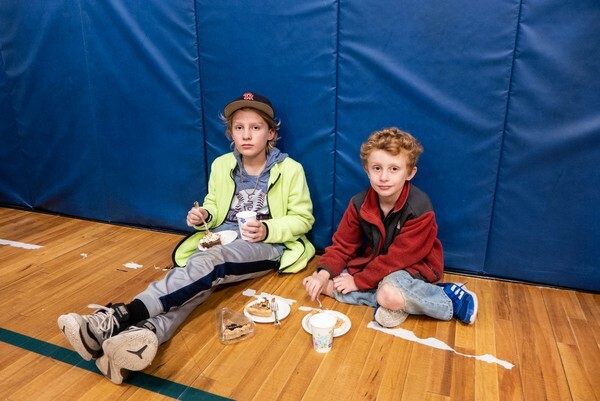 First-timers Sam (left) and Kevin Roma (right) enjoy their slices of pie. Ruth Andrews, whose key lime pie “The Lime Pie” placed first in the creme pie category, prepares to pass out more pies shortly after accepting her prize. 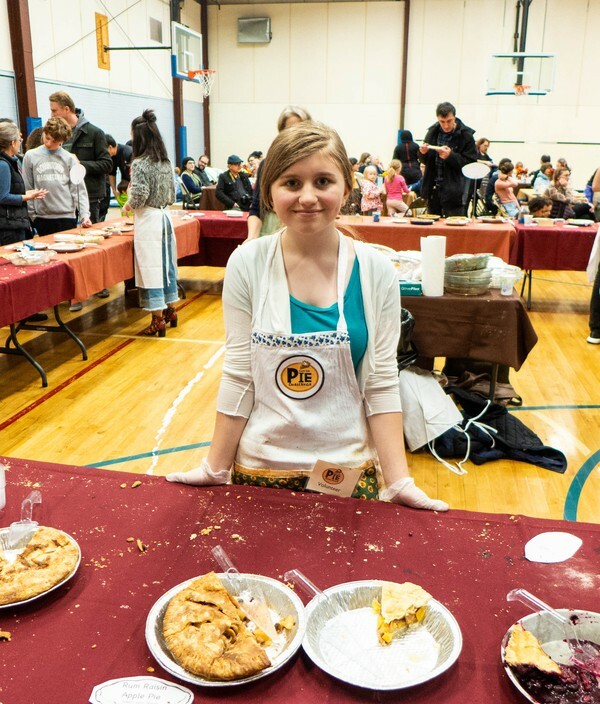 This is her fifth year submitting a pie. 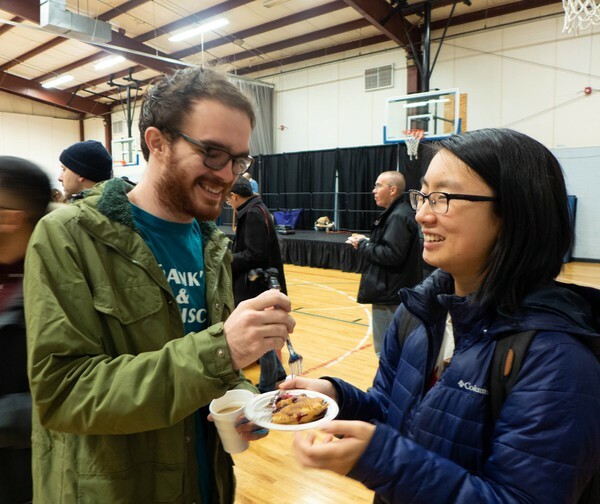 Mickey Cronin, left, and Julie Wu share a slice of pie. The two attended the event to celebrate Cronin’s upcoming birthday. 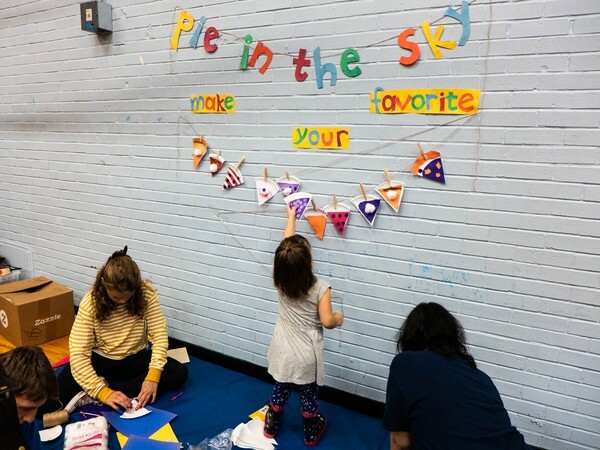 A child hangs up a pie-themed craft, at the event’s kid station. 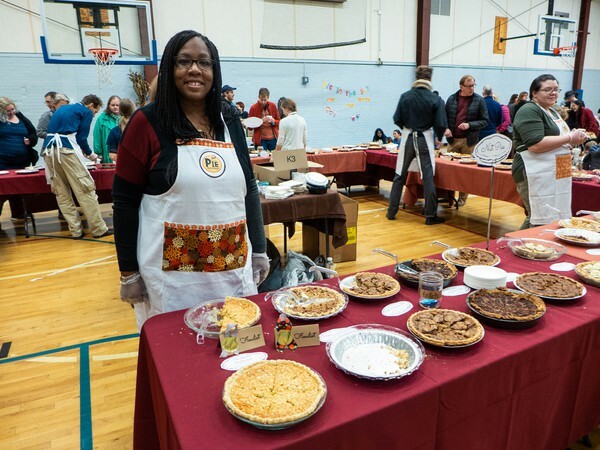 Iheoma Okeke-Banks stands by the nut pie section. Okeke-Banks volunteers for this event every year. Gray Moreau poses with her boxed up slices of pie. 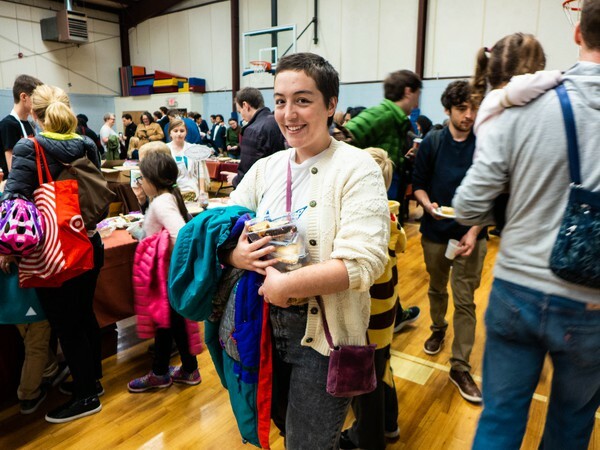 Moreau attended this event with the other residents of her housing co-op. 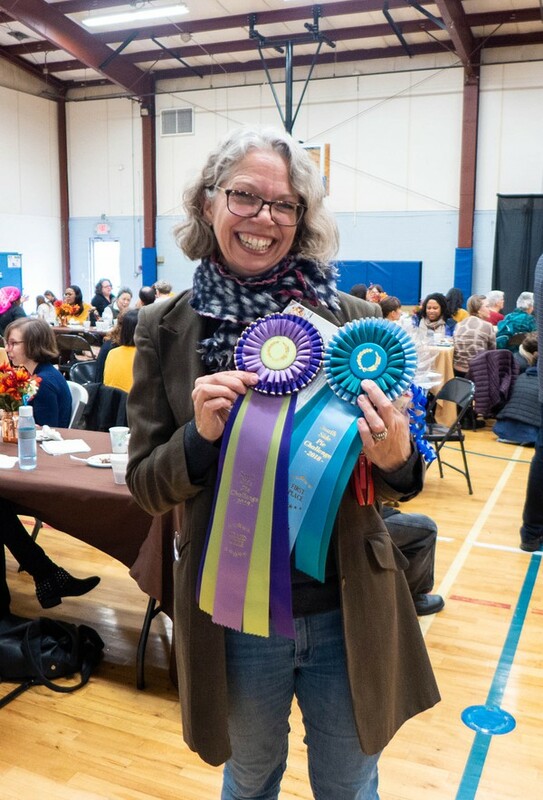 Molly Herron took home the grand prize and category first place titles for her plum pie named “What a good boy am I pie.” Herron has participated in the South Side Pie Challenge every year.